We study superfluorescence (SF) from spherical and cigar-shaped clouds of laser-cooled Rubidium atoms from the 5D5/2 level through the 6P3/2 level to the 5S1/2 ground level. The atomic system is initially excited to the 5D5/2 level from the ground state via two-photon excitation through the intermediate 5P3/2 level. The fluorescence on the 6P-5S transition at 420 nm is recorded using time-resolved measurements. 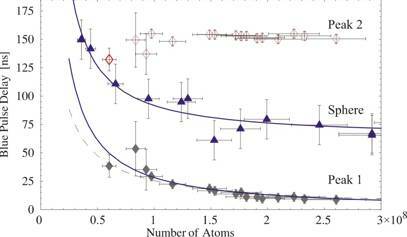 The time delays of the observed SF emission peaks typically scale as ~N−1, where N is the atom number, and are much smaller than the time delay expected for uncorrelated cascade fluorescence. Since N is significantly smaller than the threshold number for SF on the 420 nm transition, and larger than the threshold number for the 5D-6P transition at 5.2 µm, our observations suggest that the 420 nm SF emission is triggered by rapid deexcitation of the 5D to the 6P level via SF at 5.2 µm. The observed SF time delays for 420 nm emission agree with SF time-delay estimates for the 5.2 µm transition. For spherical clouds, the SF is isotropic. For cigar-shaped clouds, the SF is highly anisotropic. Along the long axis of cigar-shaped atom clouds, SF and incoherent cascade fluorescence produce temporally well-resolved peaks in the detected signal. In this case, the SF component of the signal is highly concentrated along a direction in between the directions of the two almost parallel excitation beams. The observed SF intensities scale as N, suggesting that the 5D level is regeneratively pumped during the SF decay. This experiment began as part of a sabbatical project at the University of Michigan, in collaboration with Georg Raithel and continues at York University. 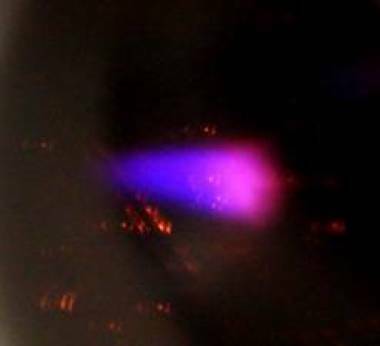 Observation of Superfluorescent Emissions from Laser-Cooled Atoms, E. Paradis, B. Barret, A. Kumarakrishnan, R. Zhang, and G. Raithel (University of Michigan), Physical Review A 77, 043419 (2008). Collision-Induced Superfluorescence, A. Kumarakrishnan, S. Chudasama, and X. L. Han, Journal of the Optical Society of America B, 22 1538 (2005). Superfluorescence Polarization - A Signature of Collisional Redistribution, A. Kumarakrishnan, S. Chudasama, and X. L. Han, Physical Review A 68, 033801 (2003). Delay time of SF vs number of atoms. The delays marked peak 1 (solid diamonds) and peak 2 (empty diamonds) correspond to temporally resolved peaks measured along the long axis of the cigar-shaped cloud. Delays for the spherical trap are shown with triangles. For the case of the cigar and the sphere, the experimental data are fitted with functions of the type aN−x + b with fit parameters a, b, and x, shown as solid lines. The fits show that the delays scale as the expected, with x = (1.12 ± 0.16) for the cigar and (1.17 ± 0.14) for the sphere, respectively. The offset b is zero for the cigar and ~70 ns for the sphere. The dashed line shows the predicted 5.2 μm delay. 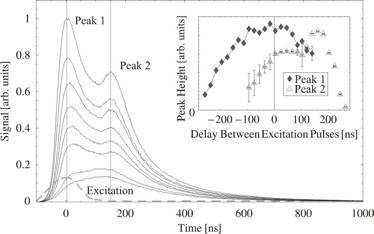 Numerical simulations for cascade fluorescence suggest that peak 2 should occur at 174 ns. MOT fluorescence at 780nm n 5P-5S transition and 420nm on 6P-5S transition.